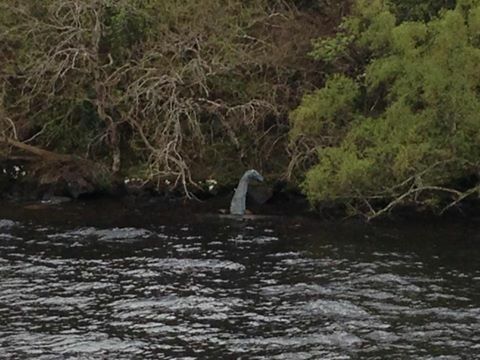 As readers will recall, an unusual video clip of a long necked object was filmed by Urquhart Bay back on May 7th. 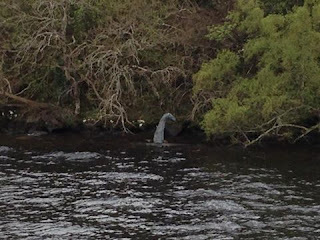 Since a photograph of a clear fake Nessie head and neck was photographed on the same day in the same area, it was surmised that someone was playing a game or conducting some kind of eyewitness perception test. The path the "Nessie" pursues would take it to the area where the photo of the fake neck was snapped. The other mystery was who the occupant of the boat was who has still not come forward to give us their view on what they saw at close range. So, it was all a bit of a mystery as to what was going on. However, I have one candidate for all this and it is Lone Wolf Media who were filming for a Loch Ness Monster and others documentary. This was mentioned in the Inverness Courier and I note that they were in Inverness certainly no later than 10th May going by this facebook entry. That was just three days after the video footage. I have contacted them asking them if they are linked to this and when they hope to air the documentary, but I have had no reply yet. As for the man on the boat, it may well be that his/her silence is due to them filming the prop from various angles and so they just panned past the object with the castle in the background. The only problem with that idea is that no professional video recorder is visible and would have to be filming from inside the cabin. It is also possible that the Russian film crew mentioned may be responsible, only time will tell how accurate all this speculation is - and we have another Nessie documentary to look forward to (assuming it is not overloaded with sceptics with the usual, boring repetitive stuff). I recently published a letter from Tim Dinsdale to Herman Cockrell and was struck by Tim's concern to Herman in case he ever ventured out in his kayak again - "... for heaven's sake, be careful ... the plesiosaurs were predatory animals!". That was back in 1961 when Tim discussed his first book, "Loch Ness Monster". What he thought of their predatory habits twenty years later as his book approached its final revision may have been less dramatic, but it brought back to mind my article on the possible predatory habits of the creature on land as well something Tim wrote some years later. During the course of the Loch Ness expeditions I have been careful to collect 'odd' stories, and scraps of information which, for one reason or another, lie outside the usual category of evidence. Much of this information is based on hearsay, which can be very unreliable; but some of it is believable because of the circumstances connected with it. One such account emphasizes the carnivorous nature of the beast — or Beiste, as it is known in the Gaelic. Some years ago, a stag was hunted down one of the glens which lead to the northern shore of Loch Ness. In fear it entered the water, swimming out strongly. When some way out it became involved in a sudden swirl. Changing direction, it headed back to the shore — but on climbing out, over the rocks and shingle, it was seen, quite literally, to be walking on three legs. The fourth leg was missing! The reason why this account has not been publicized is because the stag was not, I understand, being hunted legally. A recurring situation in the Highlands of Scotland, one may add. If this story is true, I would surmise the Loch Ness Monster was the only Loch Ness inhabitant capable of parting a deer from one of its legs. The thought naturally arose as to why we don't hear more of these predatory stories. Admittedly, it is rare to even see a deer swimming across the loch, let alone an incident like this. But I would add one other story here. It comes from the Inverness Courier of the 20th October 1933. The community of Benedictine nuns who once resided near Fort Augustus are now living close to me here at Holme Eden Abbey, and one of the lay sisters, an old Inverness-shire woman, says she can remember fifty years ago talk of an uncanny beast being seen in the Loch, and also that animals grazing by the loch-side disappeared. Livestock grazing beside the loch shores was undoubtedly a more common thing back in those days than it is now. 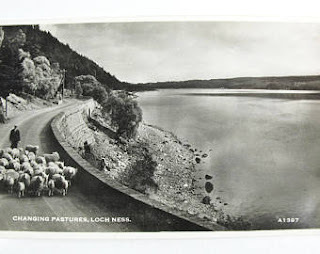 This is exemplified by the postcard below of sheep moving along the shores of the loch. Clearly, such a sight would not be possible now on these car dominated roads, but I do not see much in the way of shoreline livestock on my trips and there is more in the way of wire fencing between them and the loch. It also seems as if predation of humans is limited to the old water horse stories. I can think of no instance of a modern story which ascribes the disappearance of anyone to the Loch Ness Monster. Of course, people have disappeared around the loch over the decades and centuries. Most would have fallen into the loch from the shore or from boats and drowned. When searching old newspapers, I found quite a few stories of drowned people from the 19th century when health and safety procedures were not so important. If such a thing happened alone and the body was never recovered, it is easy to raise a question mark over the cause of the disappearance. But is the lack of human predation a proof against the Loch Ness Monster? After all, if the monster is partial to salmon, trout and the odd deer, then why not humans? It all goes back to Dinsdale's warning to Cockrell. It is reasonable to assume humans are on the menu if the monster is a form of plesiosaur. After all, it is doubtful that plesiosaurs have evolved into herbivores. Of course, their relatively small jaws could not swallow a human whole, but they could undoubtedly cause a fatal injury. Yet multiple people have swum the loch and nothing has happened. Was this just expected due to the vast size of the loch or because the creature mainly sticks to the sides of the loch? Is this a proof that the creature is not carnivorous or, for some reason, humans are off the menu? After all, didn't Saint Columba only grant the creature the freedom of the loch if it left people alone? Only kidding. However, my own opinion is that these creatures will in theory eat humans. If you eat meat and are a lot bigger than a human, it is reasonable to assume you will go for them. I would think, though, that they are opportunistic since their hunting instincts are not primarily geared to seek out humans. For example, a drowned body being scavenged or someone falling in 200 feet above them. I don't think the number of times swimmers and divers have been in the loch has been statistically significant enough to trigger such an event. The loch has a volume of 7.4 billion cubic metres, the volume of a human is about 0.07 cubic metres. The odds of a human and a Nessie being in proximity are pretty small; but given enough time, something will eventually happen. 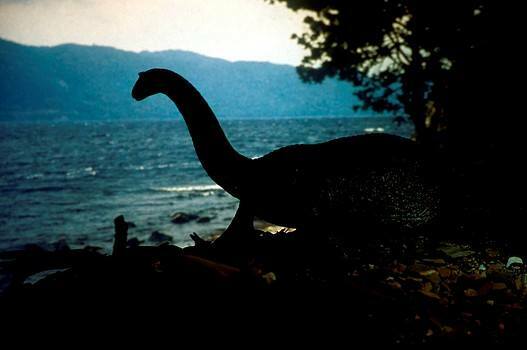 In the summer of 1885, stories were circulated about a strange beast being seen by many people about Loch Ness. It usually only appeared for a few minutes on the surface of the loch, so that no one could properly describe it. Murray Rose has been panned by sceptics many a time. It's nice to see some corroboration for what he was claiming. Whether the kelpie-averse newspapers picked this up remains to be seen. I had previously written of my monster hunting activities in the distant Isle of Lewis back in 2011, including my attempt to get to Loch Ulladale, the stories surrounding that creature as well as the various other lochs of legend. I was back on the island last July and was minded once more to go about some cryptozoological business of the aquatic variety. As a primer, I purchased a rather delightful book entitled, "The Secret of the Kelpie" from the tourist shop in the town of Tarbert (which is actually on the adjoining Isle of Harris). 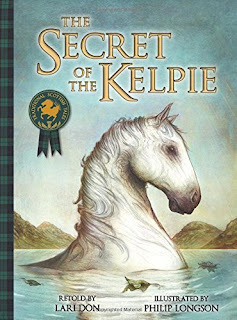 What could I find in the way of modern kelpies in 2016? Back in 2011, I had made the long hike to Loch Ulladale and was within sight of the loch before being turned back by deep bogs and a plague of horse flies. That was frustrating, but I had another loch in my sights and that was Loch Urabhal (pronounced "uraval"). This was motivated by a story from the Glasgow Herald of 29th July 1961 which is reproduced here from Paul Harrison's "Sea Serpents and Lake Monsters of the British Isles" (2002). A monster appeared in Loch Urabhal, near the village of Achmore, in Lewis, on Thursday evening (27 July 1961), Mr Ian McArthur, a Forres school teacher who is holidaying in Lewis, said yesterday. Mr McArthur had gone out fishing with Mr Roderick Maclver, a teacher from Stornaway, and his brother Donald, on leave from teaching in Aden. `Roddy and I were fishing at the shallow end of the Loch, when Roddy jumped to his feet shouting "There's something in the Loch". I then saw it myself. Donald, who was fishing farther up the Loch, did not see it, but he saw we were excited about something. It was about 45 yards away from us in shallow water and it appeared three times. It had a hump and there was either a small head or fin about 6 feet away from the hump. It swam like a dolphin but was much bigger. `Urabhal is an inland Loch, and no dolphins could get into it. I have been fishing there and so have the Maclver brothers since we were boys and have never seen anything in the Loch. I asked my father if there were any legends about the Loch, but he said there was none. He thought it must have been an otter, but this did not swim like an otter. We saw it distinctly because the sun was shining and the water was calm. I had my camera out ready for a picture when it submerged for the last time.' According to a local historian, Dr Donald MacDonald, of Gisla, there are no traditions attached to Urabhal. With all this in mind, it was off to Loch Urabhal on the 28th July 2016. The maps below give you some idea where this little loch is in relation to Loch Ness. Parking at the village of Achmore, we donned the hillwalking boots and waterproofs and headed north. The hill adjoining the village was ascended as we navigated round the hi-tech communication masts erected there. After that, nature resumed and the going underfoot was firm to soft depending on the nearby streams and contours. As you can see, Lewis is a place rather bereft of trees. It took over an hour to trudge there, but the loch eventually came into view once a ridge was cleared. As expected, it was a rather small affair. The loch measures about 900m by 400m at its widest points and I suspect the depth was not great, but obviously enough to fish from, going by the Herald account. I panned across the loch as you can see on this video. The loch was scanned for a while and nothing of a cryptid nature showed itself, apart from this object which was noticed on the other side of the loch during our surveillance. Was it a shark or some other finned life form? Unfortunately not, as it was immobile throughout and so was presumed it to be nothing more than a rock (there were other small outcroppings dotted around). Now it was pretty clear that nothing of the size described could live here for long in terms of an indigenous, breeding population. So, if this was an accurate account, it seemed the best theory was that something came in from the sea. The fact that the report stated the men were fishing implied that, like the surrounding lochs, there was a supply of trout or salmon to be had and these most likely migrated from the sea (as opposed to being resident trout). The loch is about five miles from the western coastline as the crow flies. An examination of the map does show a complex pattern of small lochs and their interconnecting streams and that revealed a route to the sea from the loch that takes in four other lochs along the way. So, a large creature could with some effort get from sea to loch. I agree with the original account that a dolphin is an unlikely candidate which leaves a seal or some other semi-aquatic creature. My only quibble with the seal theory is that a seal is unlikely to disappear in such a loch and should have surfaced frequently enough to be identified.